The Future of African Cities: Challenges and Priorities for Urban Development. Farvacque-Vitkovic, Catherine, and Godin, Lucien. 1998. The World Bank, Washington, D.C. Pp 133-139. Detailed directions on how to implement an Addressage system are available in several languages and may be downloaded in pdf format. We would welcome your comments or suggestions. Many cities do not have a coherent system of addresses. Street addressing makes it possible to locate a lot or dwelling on the ground - that is to define its address using a system of maps and charts. The addressing system is not a substitute for a cadastral-type system of coordinates, but it can be a complementary to such a system. The two systems can be introduced together and will supplement each other at every stage. Addressing makes it easier to: a) locate residents and their homes by means of an address system that can be used by the people themselves and by government officials, concessionaires, and other service providers; b) operate urban services (ambulances, fire trucks, taxis); c) enforce collection for user-pay services, in particular those provided by utility concessionaires [water companies, electrical companies]. 1 - CODIFICATION. This step consists of establishing the principles that will guide the identification of streets and the numbering of buildings. Should streets be numbered or named? It is recommended to number all streets, and they can be given names over time beginning with the most important streets. 2 - NUMBERING STREETS. To make it easier to establish local points of reference, the city can be divided into address zones, each of which can be given an identifying number or letter. Street addresses will start with this identifier followed by consecutive numbering. Thus Street 2.34 or Street B.34 or Medina Street 34 would be three ways of numbering the 34th street in Zone 2, Zone B, or the Medina District. 3 - MAPPING. This task consists of establishing an address map and its accompanying street index. The address map shows the boundaries of address zones, the names or codes for streets, the starting point (point zero) and end points of streets, a coordinates grid, and major facilities. 4 - NUMBERING DOORWAYS. 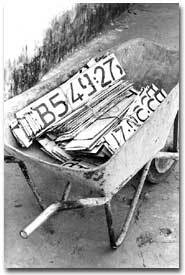 Numbering, the longest phase in establishing the address system, is performed while road signs are being installed. Each street is visited, and a number is assigned to all doors and entrances. It is best to use a metric system numbering system, where doorways are assigned a number according to their distance from point zero. Odd numbers are located on the left side of the street, even on the right, rising as they move away from zero. House numbering will involve a meeting between the occupant and the numbering team (working under an official municipal mandate), during which information can be gathered that will serve as the basis for the directory and a possible database for the city. 5 - COMPUTERIZED ADDRESS DIRECTORY. This is compiled on the basis of information gathered during the doorway numbering exercise and will serve as reference for government agencies and utility concessionaires. To keep costs low, we recommend that: a) street signs be placed at only one corner of an intersection, or: b) at every second intersection, if numbering is continuous; c) durable materials be used for signs for named streets (materials for numbering streets can be of lower quality); and d) sponsors for the operation be identified. Addressing generally falls to the municipality, which will be the contract manager of the operation. Implementation is split among municipal services, consultants, and companies. The municipality may set up a unit to manage its involvement. The unit can be an appendage to an urban project and then be gradually integrated into municipal services. - Implementation: The bulk of funding is committed at this stage, and the various players are encouraged to take the initiative so that the operation can be completed as quickly as possible. - Maintenance: With most of the work completed, the remaining task is to keep the addresses and the directory continuously updated. a) ensure that the public is made aware of the addressing campaign and work with the elected officials to find a name for each street. b) perform or supervise coding and mapping. c) draw up the terms of reference and requests for proposals from consultants and firms interested in undertaking the addressing. d) supervise the erection of street signs and house numbers. e) conduct interviews with the occupants. f) oversee the preparation of the computerized address directory. g) provide for maintenance of the address system. h) disseminate and exchange address data with the authorities and utility companies. The work of codifying, mapping, promoting public awareness, and training will typically be performed by consultants. Sensitizing the population through radio, television, and the press is vital. The effort must be repeated, sometimes for several months. The message should emphasize how useful the system will be for delivery of public services (ambulances, fire trucks) rather than calling attention to the potential for easier tax collection. Priority should be given to regularized neighborhoods where the chances of success are greatest. In the poorer, underserved settlements, the assigning of addresses is complicated and can even be taken as implicit recognition of squatter rights. The link to improvements in local tax systems occurred only gradually in addressing experience. The most interest comes from utility companies (water, electricity) who are often happy to cooperate and take part in the work. An address system makes it simpler to identify the tax base and in particular its business component. It is a good idea to involve the utility concessionaires in the addressing operation, as a way of helping them locate their customers. The address registry can be reduced to a simpler version of tax rolls. The directory could include include a listing of doorways or taxpayers, each ones address, the amount owed in taxes, a possible reference to the method of assessment, and an indication of whether the tax has been paid. This same type of registry can be used for property taxes, especially if they take the simple form of an urban tax. Locally-made house signs ready to attach.